This unique island boasts high cliffs dropping into dramatic beaches, two craters and slopes lined with dense woods, strikingly coloured wild flowers and vineyards. Santa Marina Salina, Lingua, Malfa and Rinella each have a character of their own. What they share is their tranquillity. Salina dates back to the Greek times. They called it Dydime (double) due to its two (now extinct) volcanoes. Its present name is due to Lingua’s salt pans. Salina is the only island among the Aeolians that features natural springs of water. This factor and the former eruptions have gifted it with fertile land where capers and grapes for malvasia wine are abundant. Boats arrive at Santa Marina or at the fishing village, Rinella. Malfa in the north and Leni are other important villages. 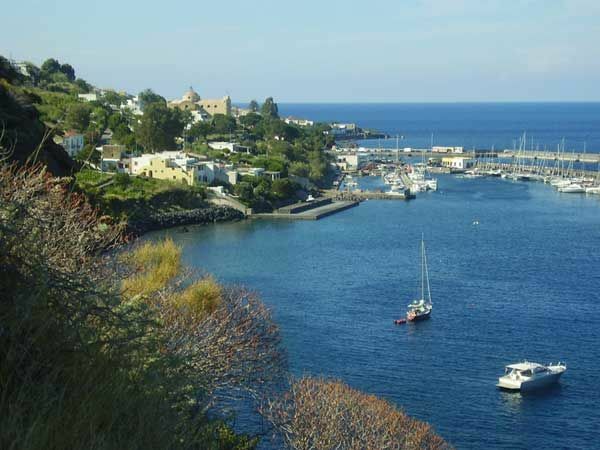 In the summertime there are tourist booths open in Rinella, Malfa and Santa Marina, which is the most important town and a port. Via Risorgimento, parallel to lungomare, divides the town in two with typical Aeolian architecture of walls painted in different colours and circular windows. On the same road you will find both designer and grocery shops. As you leave the docks turn right to get to pebble beach. If you are looking for an active holiday or some time in peaceful nature you may wish to climb the Fossa delle Felci volcano which reaches 962 m at its summit. The Sanctuary of Madonna of Terzito is located in a valley between Monte dei Porri volcano and Fossa del Felci. Pilgrims flock here especially at the Assumption in August. There is a bus departing from Santa Marina to Rinella and Leni which calls at the sanctuary. There is a signposted picturesque path sweeping across fields of wild flowers and asparagus crops from the church up to the peak, a route that takes approximately two hours. The last part of the ascent is quite challenging but it is worth it since you will be rewarded with an unrivalled vantage point from where you can see all the islands. Lingua is 3 km away from Santa Marina and has it sunbathed salt pans. Lingua also some hotels, informal restaurants (trattorie), a little beach and a lighthouse. Its buildings are in the typical Aeolian style- cubed shape in white and light blue with tomatoes and herbs growing outside giving a lovey colour contrast. From Lingua going past Brigantino you ascend to Fossa delle Felci. As you ascend you find corn and barley fields, then olive trees and finally vineyards of malvasia wine grapes grown using traditional techniques. The vines were supposedly planted by the Greeks. Malfa lies on a cliff looking over the sea. Smart hotels line its narrow lanes, ther´s good bathing, a little shingle beach, and best of all, tranquillity and privacy . It is the biggest town on the island yet never is overrun by tourists. Its Museo dell’Emigrazione Eoliana housed in the Palazzo Marchetti provides an interesting insight into the magnitude and consequences of emigration from the islands. Pollara’s beach, the setting for the famous film Il Postino, features unsurpassed beauty and a background of volcanic cliffs. To avoid a long walk from Pollara get off the bus at the steps leading to the beach. A winding road leads to Rinella’s pink, white and blue houses sitting on the hill that descends to a beach of black sand. Rinella is famed for underwater spearfishing. There are also other quieter beaches such as the one in Campeggio Tre Pini camp or a stretch of pebble beach. Rinella is reached by bus or hydrofoil departing from Santa Marina. 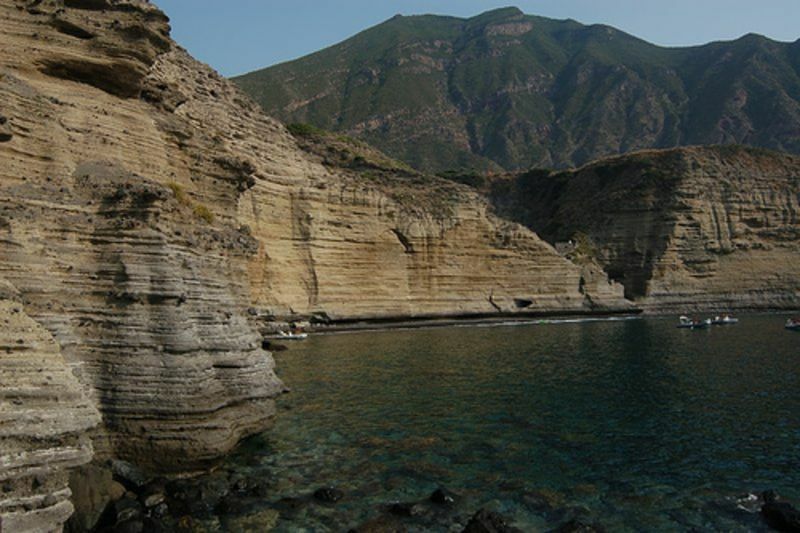 Eolie Adventure at Santa Marina harbour organizes summer hiking excursions on the Aeolian islands. Hotels generally allow non-guests in their restaurants, provided they have reservations. In Santa Marina Mamma Santina restaurant can be found on Via Risorgimento and is praised in Cuisine Italiana. Cucinotta Rita on Risorgimento is perfect for any meal. Everything is delicious and fresh in this small, friendly restaurant. Portobello on Via Bianchi provides views of the sea and carefully prepared and presented dishes. In Lingua A Cannata should be visited according to the Slow Food organization. It specializes in fish and sea food. Reservations may be necessary in the summer. Da Alfredo in Cucina offers a spacious terrace with tables looking out onto the saltpans. In Rinella on Via Rotabile Hotel L’Ariana has an excellent restaurant and bar. BY BOAT: in the summer boats can be hired at Levante on Via Risorgimento in Santa Marina. BY BUS: buses operating on the island leave from the bus stop on the main square. 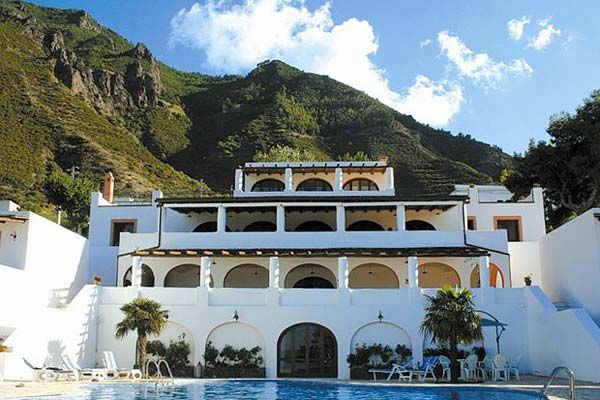 Those going to Malfa leave passengers at the top of the town but depart from just by the hotel Punta Scario. Regular Citis buses serve the main villages and Valdichiesa.. There are timetables at the port and other places. BY FERRY AND HYDROFOIL: in the summer from other islands to Santa Marina (services: 8 a day), to Rinella (services: 4 a day). There are fewer services the rest of the year. Ustica Lines and Siremar’s ticket booth are in Santa Marina and Rinella’s harbours. BY SCOOTER OR MOTORCYCLE: Ideal at Rinella because you´ll want to be out enjoying the landscape. Eolian Service hires them at Rinella and Antonio Bongiorno on Via Risorgimento in Santa Marina.